Emberlight is proud to announce our Multi-Touch System (MTS). 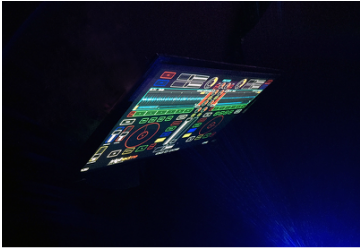 Our system is based on a large format infra-red touch surface and is designed for live performance and portability. MTS sports a 46" IR 10 point touch surface in a rear projected configuration. We pride ourselves as being Australasia's only company promoting this technology and have extensive knowledge in large format touch surfaces. As part of our product line-up we are proud to bring to our customers an array of Laser Projection related products. Emberlight laser systems are state of the art and cover an array of uses from corperate logo/graphic projection to art instalations and large venue shows. Our laser projection systems range from low-cost mono color units to larger, high powered multi-colored units for the auditorium or stage. All our laser units are fully featured for the discerning customer. The best thing to happen to the strings since string was invented. Kromalaser Laser Harps feature a rugged base unit producing multi-colored laser "strings", simple setup & convenient/reliable performance. The Kromalaser range of Laser Harp MIDI and ILDA controllers will take your performance to a whole new level. For the discerning VJ artist Emberlight is pleased to present Reolume VJ software. Resolume is the leading VJ performance platform of choice for any video artist and comprises of two flavors - Avenue & Arena. Resolume VJ software is optimized for any video performance situation and is compatible with Windows and OSX.